Our ladies' Bible study group had a Valentine brunch yesterday, and everyone brought a small gift to exchange. I made a small journal/blank book to give. I just love this new Art Blooms set from Crafty Secrets. The whimsical designs remind me of folk art and are open to a lot of different color schemes. I paired the stamped image with some Amy Butler paper from K&Company, coloring the image with Copic markers to match the paper. The inside pages are made from Gina K. Designs' Pure Luxury ivory cardstock, and the outside covers are made from Core'dinations Chocolate Box cardstock. Each inside page is stamped with a small accent on the bottom right-hand corner, but other than that I left the book blank. 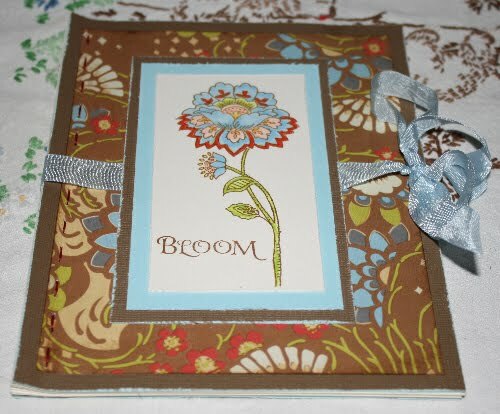 It can be used as a sketch book, journal, note book, or mini-scrapbook. Thanks for stopping by today! I hope you are experiencing some of the wonderful sunshine and warmer temps that we've been having here in Western PA the past couple of days - a rare mid-winter treat for sure! Beautiful journal, Marcy! I love that set, but haven't used mine yet--better get busy! Thanks for inspiring me! Ironically, we've got all the gloom, cold & rain here in California this week--so glad you're enjoying some sunshine! Your handmade journal is beautiful! Great colors and I like the stitching, too! Thanks for the sweet comment on my BIG TOP project!